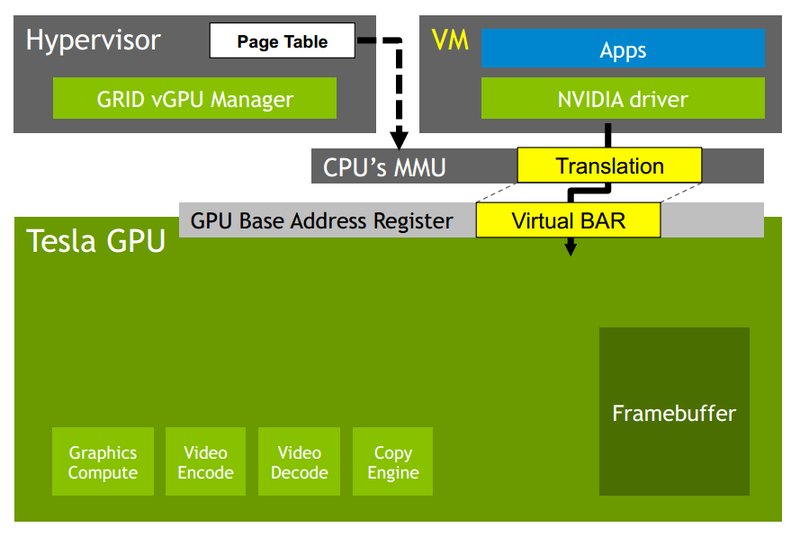 When vGPU was released for Horizon View 6.1 back in March 2015, it was an exciting addition to the product line. It addressed many of problems that plagued 3D Graphics Acceleration and 3D workloads in virtual desktop environments running on the VMware platform. 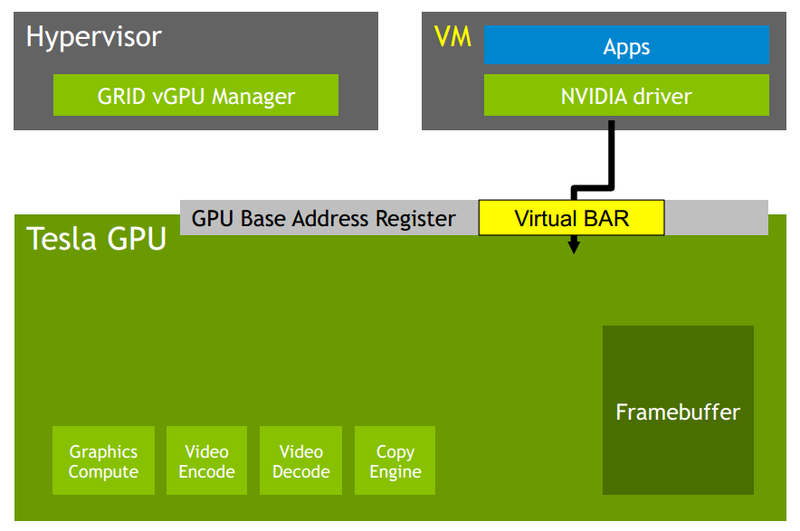 vGPU, running on NVIDIA GRID cards, bridged the gap between vDGA, which is dedicating a GPU to a specific virtual machine, and vSGA, which is sharing the graphics card between multiple virtual machines through the use of a driver installed in the hypervisor. The physical cores of the GRID card’s GPU could be shared between desktops, but there was no hypervisor-based driver between the virtual desktop and the GPU. 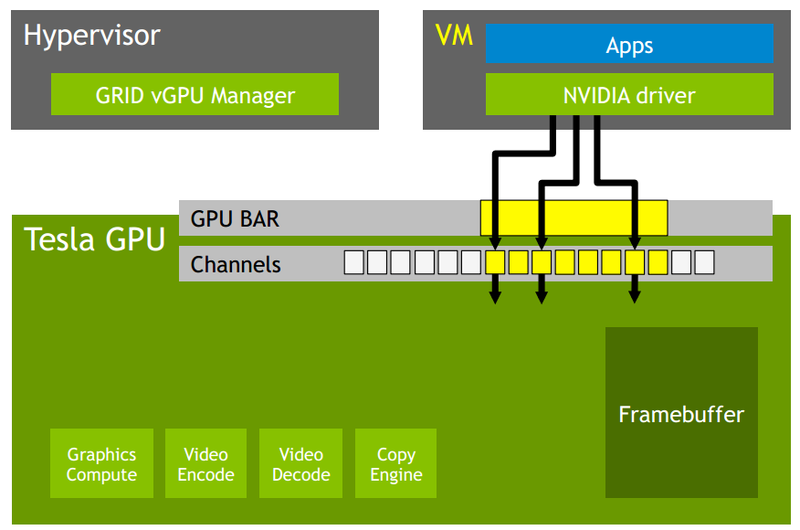 The hypervisor-based component merely acted as a GPU scheduler to ensure that each virtual desktop received the resources that it was guaranteed. While vGPU improved performance and application compatibility for virtual desktops and applications, there were certain limitations. Chief amongst these limitations was support for blade servers and virtual machines running Linux. There were also hard capacity limits – GRID cards could only support so many virtual desktops had vGPU enabled. 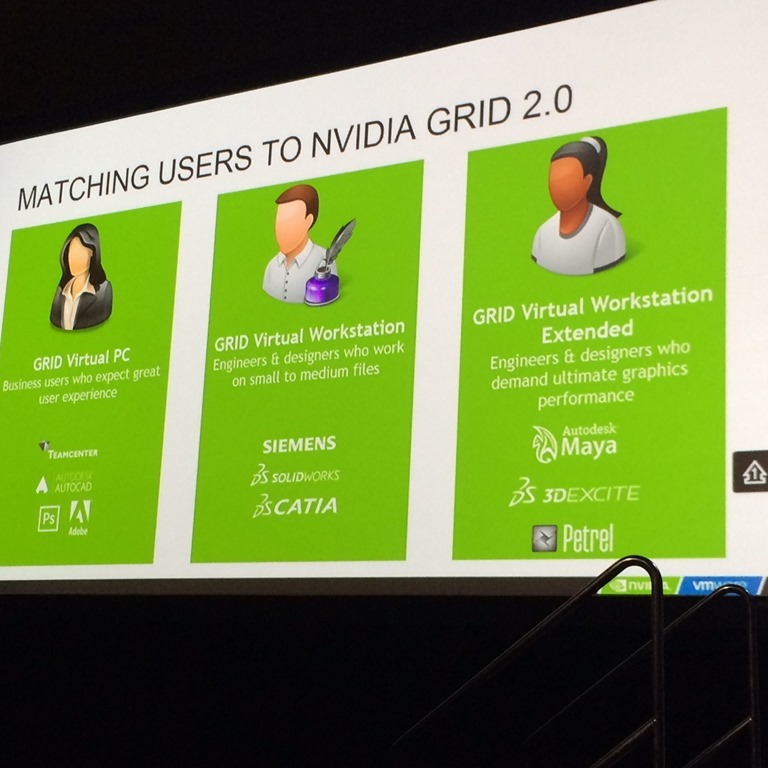 Today, NVIDIA is announcing the next generation of virtual Graphics Acceleration – GRID 2.0. Higher Densities – A GRID card with 2 high-end GPUs can now support up to 32 users. Blade Server Support – GRID 2.0 will support blade servers, bringing virtual desktop graphics acceleration to high-density compute environments. 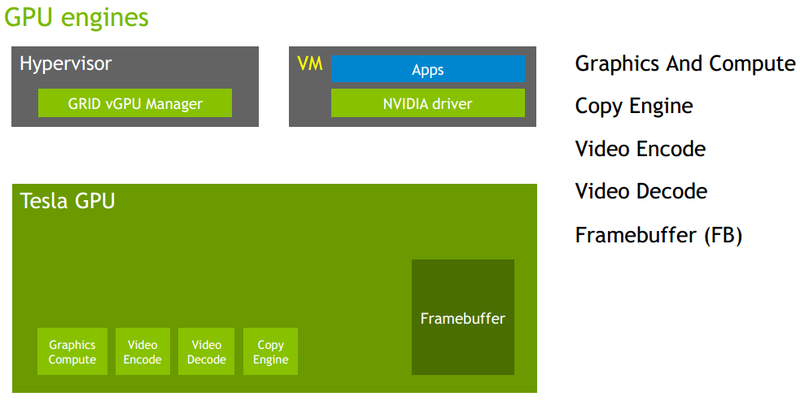 Linux Desktop Support – GRID 2.0 will support vGPU on Linux desktops. 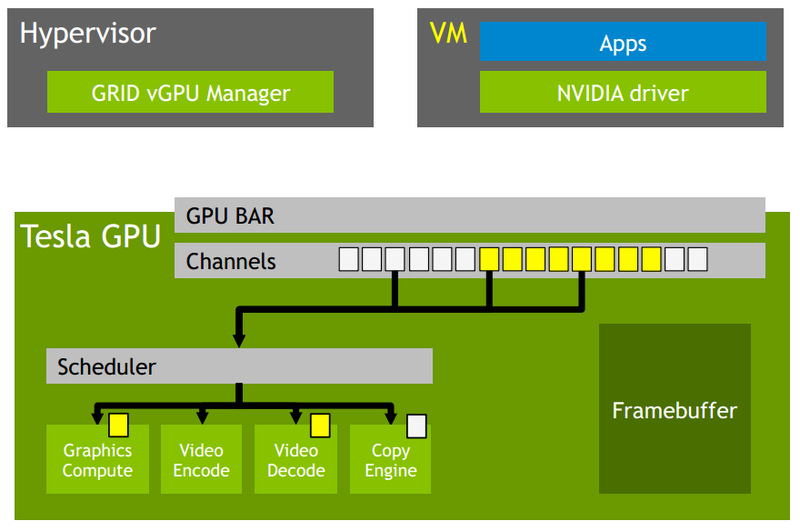 This will bring vGPU to a number of use cases such as oil and gas. 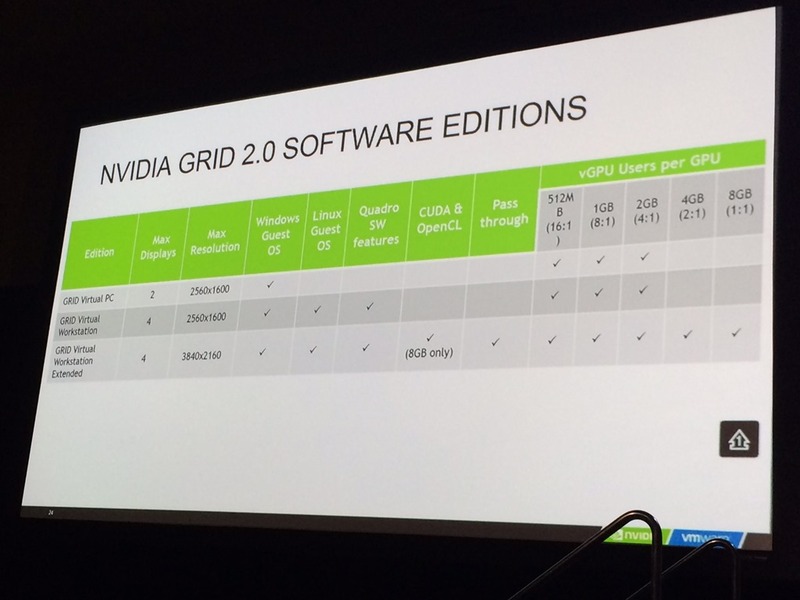 GRID 2.0 will also offer better performance over previous generations of GRID and vGPU. NVIDIA is announcing two new graphics cards alongside GRID 2.0. These cards, which are built on the Maxwell architecture, are the M60 – a double-height PCI-Express card with two high-end Maxwell cores, and the M6 – a GPU with a single high-end Maxwell core that is designed to fit in blades and other rack-dense infrastructure. The M6 is designed to have approximately half of the performance of the M60. Both cards double the amount of memory available to the GPU. The M6 and M60 each have 8GB of RAM per GPU compared to the 4GB per GPU on the GRID K1 and K2. Both the M6 and the M60 will be branded under NVIDIA’s TESLA line of data center graphics products, and the GRID 2.0 software will bring the graphics virtualization capabilities on top of these new Maxwell-based Tesla cards.. The M60 is slated to be the direct replacement for both the GRID K1 and GRID K2 cards. The K1 and K2 cards will not be discontinued, though – they will still be sold and supported for the foreseeable future.